With faith, in the pattern and in my calculations, based on a swatch or two, I finished the Whispy Cardigan last night. 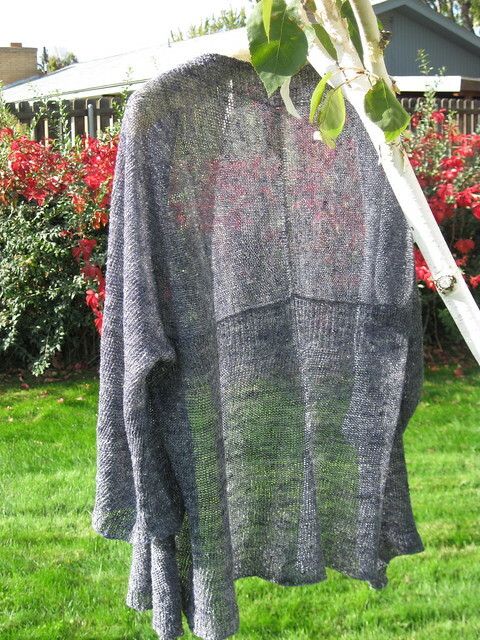 Before washing, it didn't much resemble the lovely drapey cardigans in the pattern pictures. Knitting with this stiff, lace-weight yarn has been difficult. I had to wash my swatches rather harshly to get a fabric I liked. Because of this, I had to knit according to the calculations I'd made from the swatch. I calculated both the row & stitch gauge, and used those numbers, times the inch measurements of the pattern, to adapt this pattern, written for wool yarn, to this linen string. And sure enough, after washing, I was left with the Whispy cardigan I was hoping for. Except for one small problem. The linen yarn wasn't easy to knit. It's not resilient. I often found I'd inadvertently dropped a stitch. Unfortunately, two of the stitches I'd dropped didn't make themselves known until after my sweater had gone through the wash a couple of times. There were two of these, one on the body of the sweater, another on one of the sleeves. A true perfectionist would have unraveled and reknit. I, however, used a crochet hook to reloop the stitch to the point I assume it was dropped. Then I used yarn and duplicate stitch to anchor the stitch in the garment. It ends up looking like a decreased stitch. Given the nubby and variegated look of this yarn, I'd dare you to find it. Except I think it would be more polite of you not to look. I made this sweater to wear over t-shirts and tanks in the summer. I wanted something that wouldn't add a layer of heat, but would add a layer of style. I tried to wear my new sweater yesterday over a tank, and found that a little skin showed about my underarm. I don't think it'll bother me in the summer, but mid-October, it looked a little odd, and felt a little cool. So I wore my new Whispy over a long-sleeved t-shirt. Not really a good look, but I'm afraid it's the best I can do till I bring this back out in April or May. Euroflax Milan, color Granite. Two cones @ 100 g., 625 yards. Next summer, I'll know better how well I like this sweater. But overall, I'm pleased. It turned out pretty much as I expected. Quite frankly, when I ordered the yarn, I thought it was more black with natural, when in reality it's more navy with natural. I wouldn't necessarily recommend anyone else knit this sweater in linen. I don't like knitting with linen. But I think a feather-light linen sweater will be just the ticket when the mercury rises next spring and summer. It looks lovely, hanging there in your tree -- and on you, too! I think your "fix" is the way to go. Only YOU will know (and I'd never look). You'll love having this one ready when things warm up again next spring.